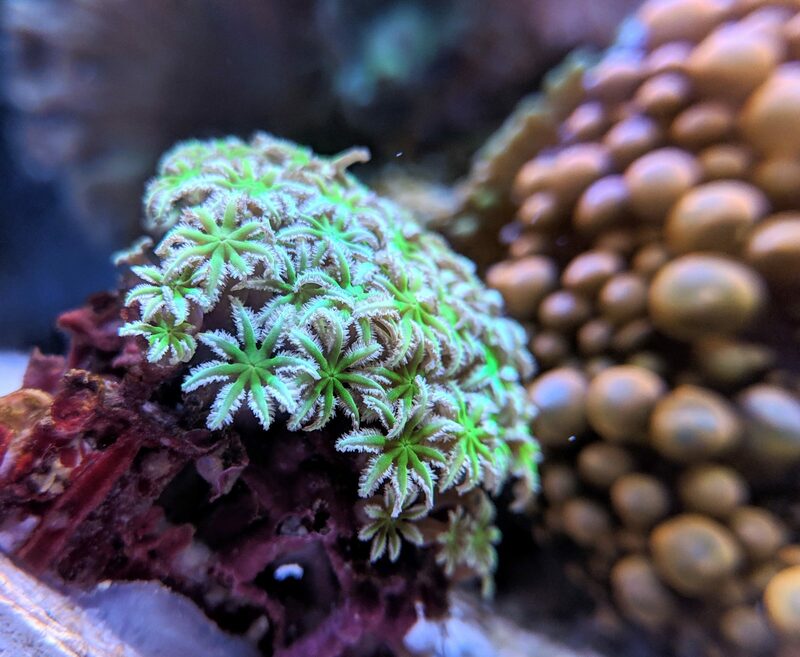 I got a couple new corals at our local frag swap this weekend and figured I'd post a few pics from the water change yesterday. I have a lifeproof case on my phone now, so I've been experimenting with how helpful being able to photograph underwater is. So far I feel meh about it. I got the john deere leptastrea and pagoda cup that I've been wanting, as well as a couple monticap frags so I can try doing a mid-level shelf. We'll see how it goes. I wanted a pink/red and a purple to possibly swirl around each other, but I have no idea how these will grow. One of them is the starburst, which should be nice, and the other is just another idaho grape, but they were free so I figured I'd at least experiment with them. I also got an interesting green/pink/yellow mushroom that I don't actually have space for 🤦‍♀️. I haven't been good about testing lately, but seems phosphates are still a little high and alk has finally started dropping. I guess it's time to start looking into dosing! Calcium and magnesium are still super high though. 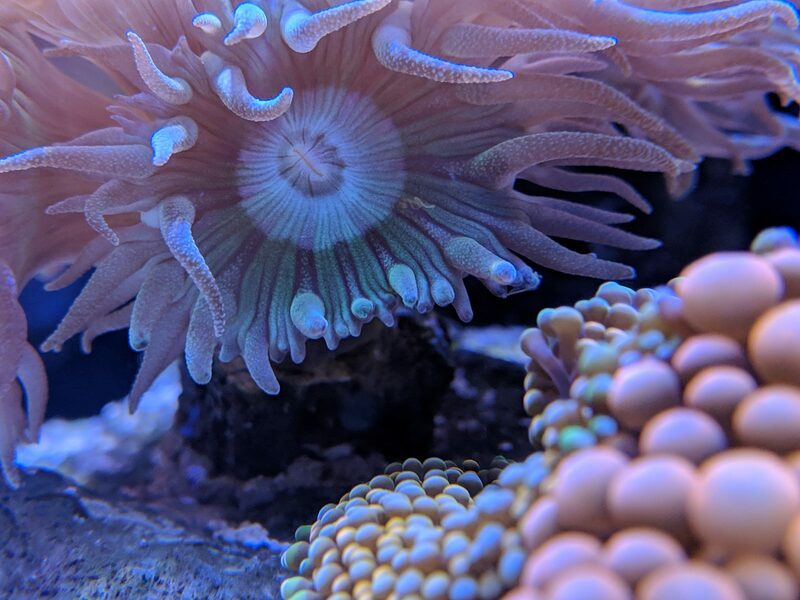 Oh and the sun corals are totally happy and healthy and sooo beautiful again after getting back into an every other day feeding routine, yay! It actually decided to completely let go of the frag disc, but thankfully I found it and got it to attach to this rock pretty quickly, so I've moved it to a spot with less light, less flow, and less Graygrumps running over it. I have three cats but this one, Momma Jane (a failed foster and 5x cooler than our other cats), is OBSESSED with this tank. Almost as much as I am! I feel like I have so much to update on but I don't have time to make a long post right now SO I'M JUST GONNA SHOW OFF MY PRECIOUS NEW FISH THAT IS AS CUTE AS A BUTTON AND I'M SO IN LOVE. It just arrived yesterday but seems pretty comfortable and Graygrumps seems to accept it as a semi-friend. They didn't want to eat any mysis last night but has been picking at the rocks a lot, so hopefully it's getting some meals in. Last night it was swimming all over the tank but today has mostly stayed in the rock work and come out to investigate me and the camera a little bit. 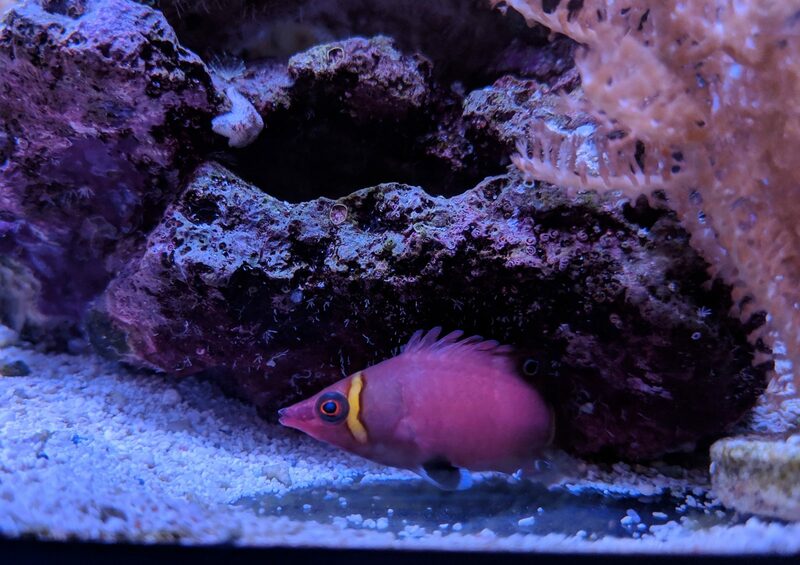 I had been debating about which of the possum wrasses to get but the Yellow Banded was the first one my partner saw and really loved and I saw this one in the diver's den and felt like it was one of the nicest ones I'd seen. Basically love at first sight. Now cross your fingers that it stays happy and healthy! Cute fish! Great addition to this tank. Wow! Impressive colors. Very unique. Thanks for sharing! Alright, let see if I can fit a full update in! Everything is still chugging right along. Things are really growing and starting to run into each other. 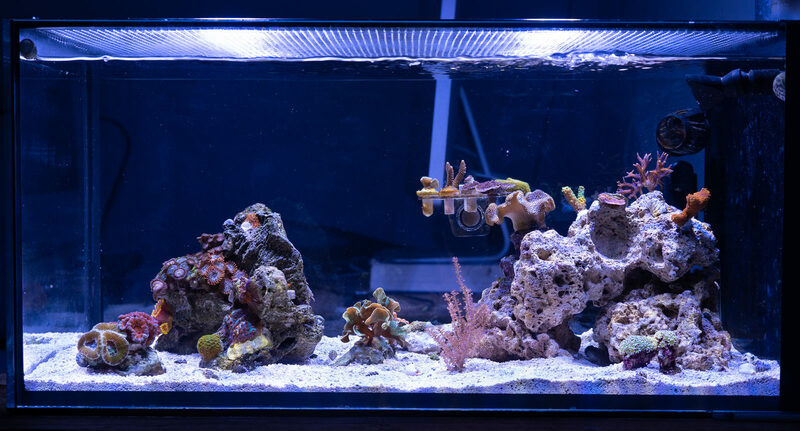 I was feeling really committed to sticking to the 10 gallon and not upgrading, but I think a IM20 Peninsula is in my future. 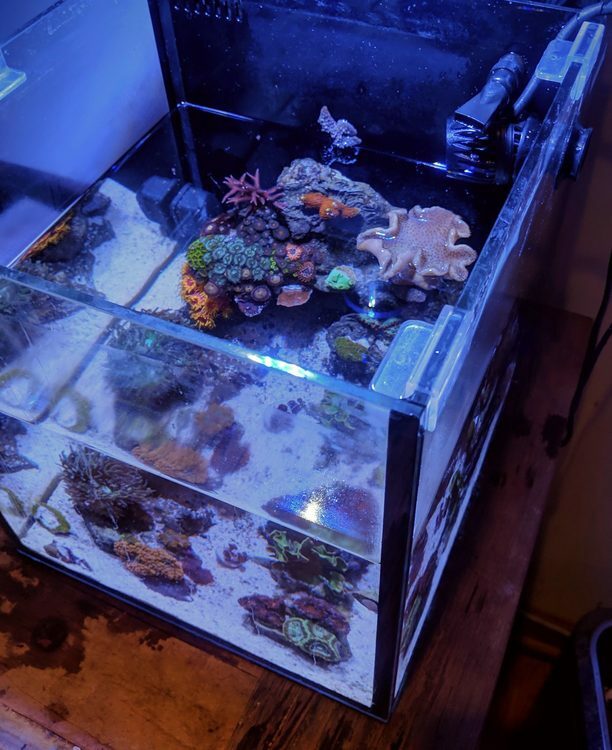 There's only like 2-4 more corals I REALLY want to have for my dream reef, but I just don't think it's all going to fit the way I want it to, nor without some frustrating coral warfare. 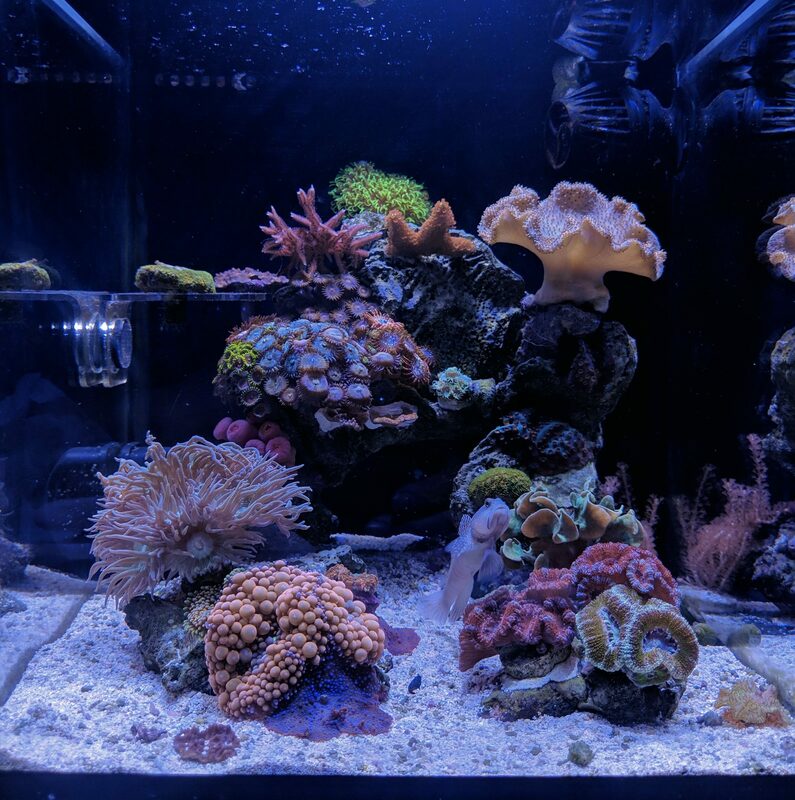 I think a 20 long could be the perfect dimensions for adding a few more corals but letting everything breathe and get a little bigger. I also just love the multi-sided aspect of it and it would work perfectly in this location. Currently trying to convince someone local to let me buy their used one. Anyone have tips for transferring everything to a bigger tank? 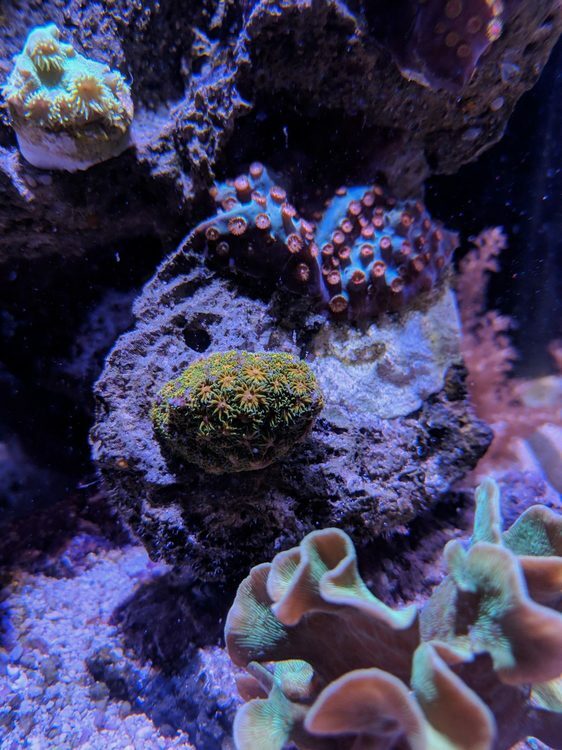 Like an idiot newbie I put both my zoas and cyphastrea on my single, main rock. I read the warnings but figured these were much prettier and more slow growing than something like xenia or GSP, so I could make it work. It's not gonna work. 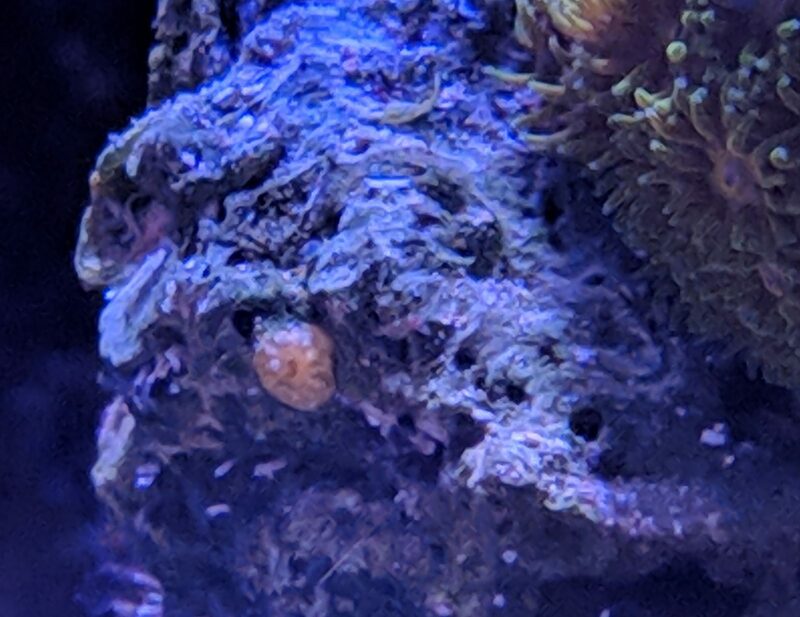 I guess it's good news that gluing over the cyphastrea that was dying back worked really well, and it seems quite happy with the new space I've given it to expand. I just am going to have to move my leptastrea and get the yellow leather out of it's temporary home soon. 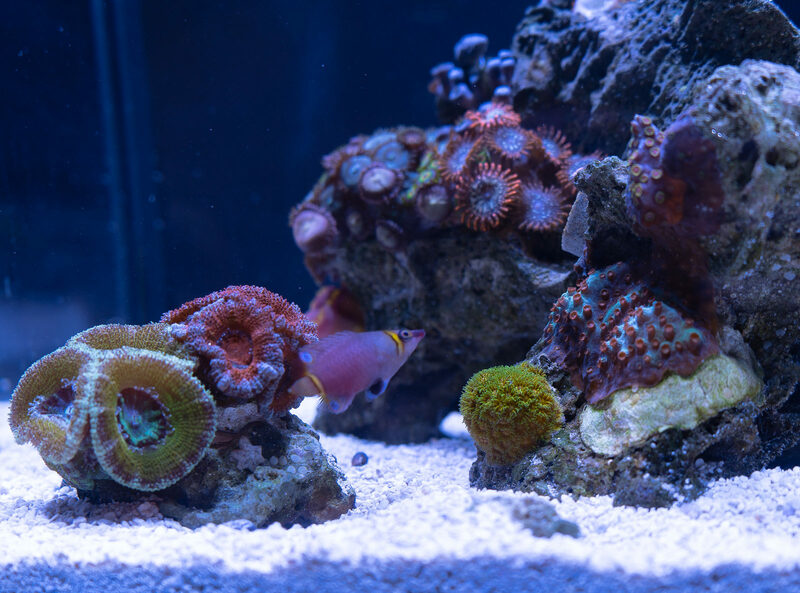 The zoas are all scrambling over each other to get the most light, which I don't mind too much, but they also seem to have really increased their growth speed as the competition has gotten more pressing, so they are spreading out quicker. They've also gotten really long stalks in their efforts. 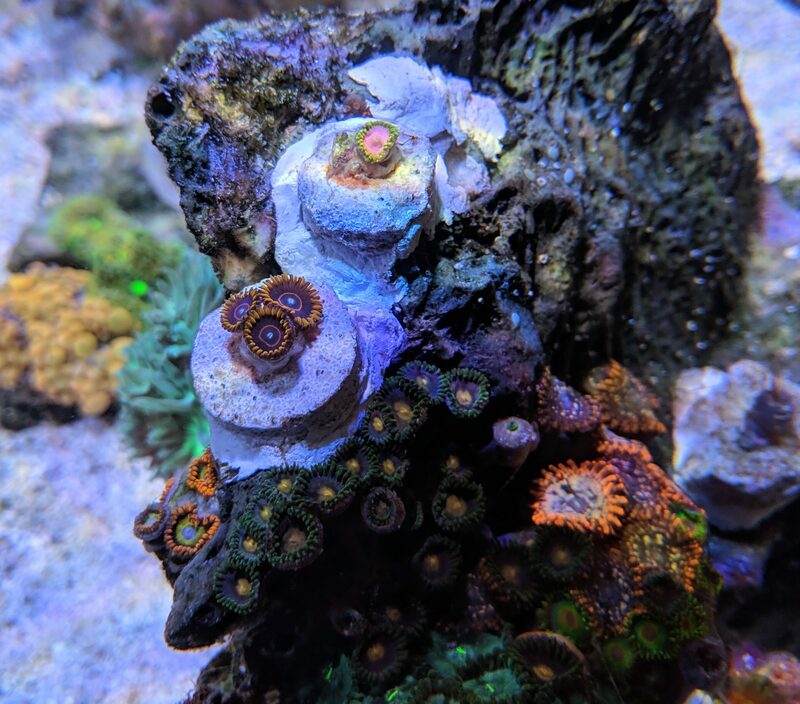 They will be taking over my bird's nest and lil pagoda cup frag any day now so I'll probably have to start fragging soon. Not looking forward to that since I can't take the rock out. You can also see further back what I think is a rhodactis that doesn't seem to like the discosoma nearby. It's been very slowly looking worse, so I'm not sure if it's the disco or something else. Obviously the ricordea doesn't seem to mind the disco at all. My sun corals have been doing well with regular feedings every other day or so and I'm pretty sure they spawned and I have babies around the tank. You met the new fish in the previous post, but why not one more photo? 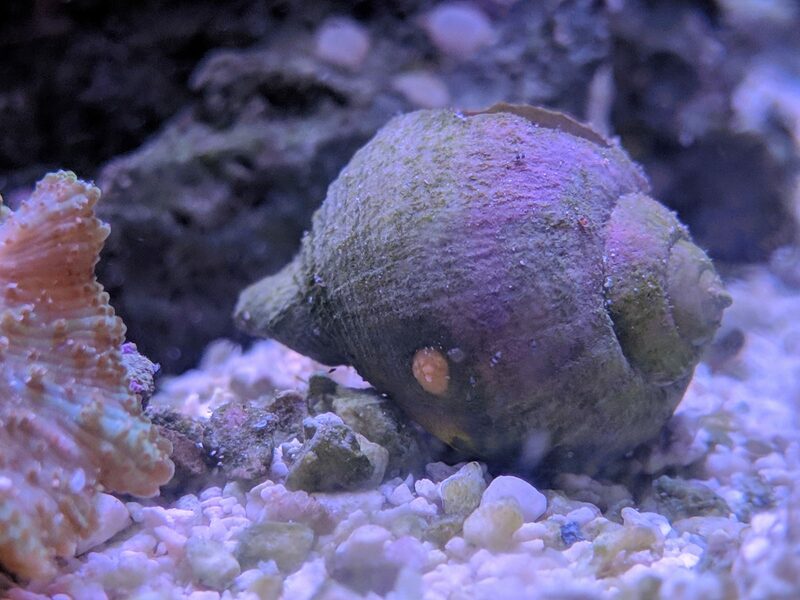 I still haven't seen it actually eat food I put in the tank, but it doesn't seem starved, so hopefully it's just taking its time and depleting the pods first. It also has gotten a lot more shy than that first evening in the tank but I'm hoping it will get a little more outgoing once it's comfortable. I read of people with possum wrasses they never even see, as well as others that are total hams, so I'll just wait and hope. Love your pictures, what are you using to shoot? Amazing clarity. Just a phone, but often with colored or macro lenses. 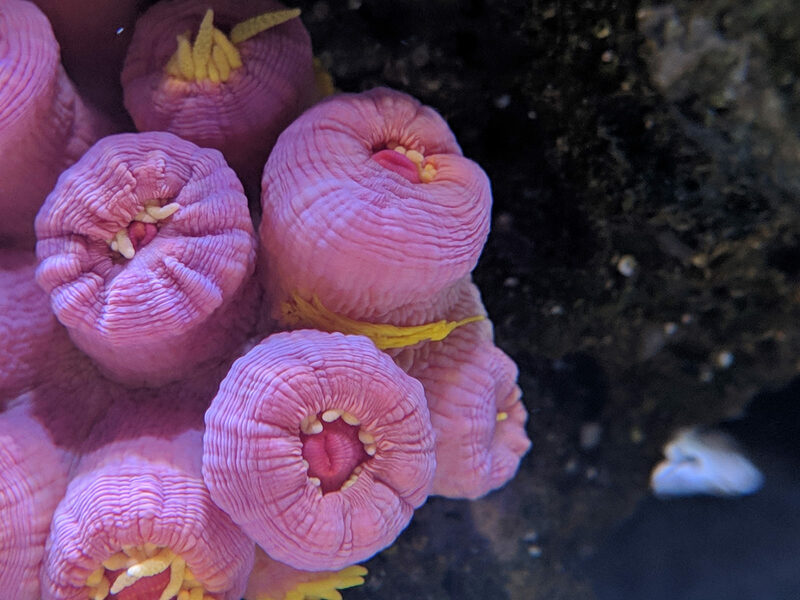 It's a pixel 2 and I've got the Polyp Lab Coral View lens kit, which I like a lot! 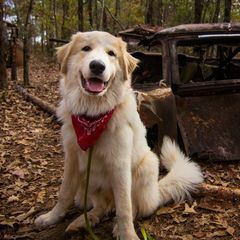 Love your tank! The possum wrasse and the sun corals are my favorite. You've got me considering a possum wrasse for my IM 10. Does it stay out and visible most of the time? I've only had it for a few days. It was all over the place the first evening but has been hiding since then. It seems like it often is out then hides when I come in the room. I'm hoping it's still warming up to things! I've heard of some that are hiding constantly and some that are always out and about, so it probably could go either way. 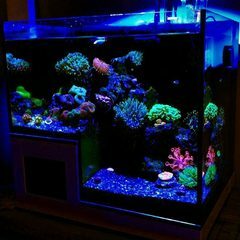 I'm curious if there's anything that encourages it to come out more, like not having any other fish, or maybe having fish that are out and build it's confidence, etc. I'll be taking down the 10 and keeping it as an emergency backup. I ended up getting live rock from someone local that I trusted pretty well when they said it was clean. I'll be moving all the rock from my 10 over, and keeping mooost of the corals where they are, creating space for a little more SPS and sand dwelling corals I've had my eye on. 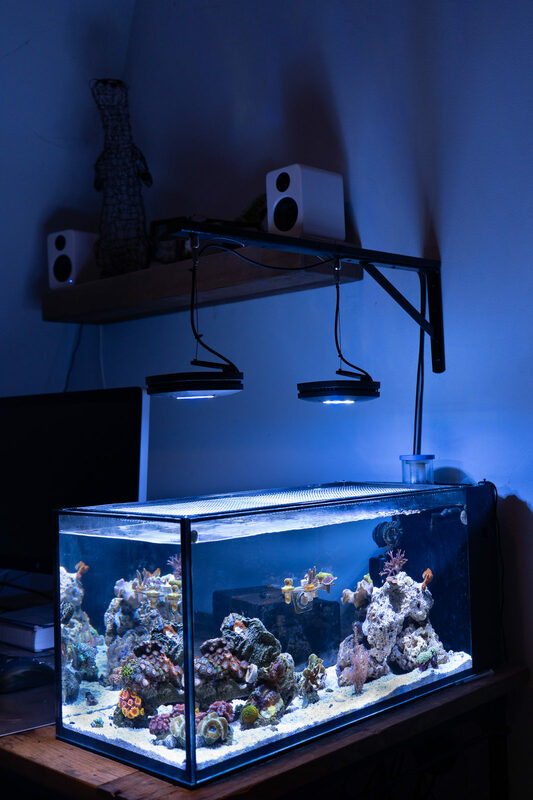 Lighting plan is to have 2 AI Primes over the tank with a DIY mount. Hope yall like the industrial look! I'm planning to make my own lid as well. The tank is so beautiful open but I don't like chancing my fishies' lives on it. Trying to scape has been pretty difficult without having all the rock in there to play with. I'd like to keep the rock work pretty open and sparse. I'm trying to get the alkalinity up in my 10 by manually dosing and it seems to be working fairly well, just don't love keeping the precise schedule up and really need to get a pump/automated system soon but still can't decide what to go with. 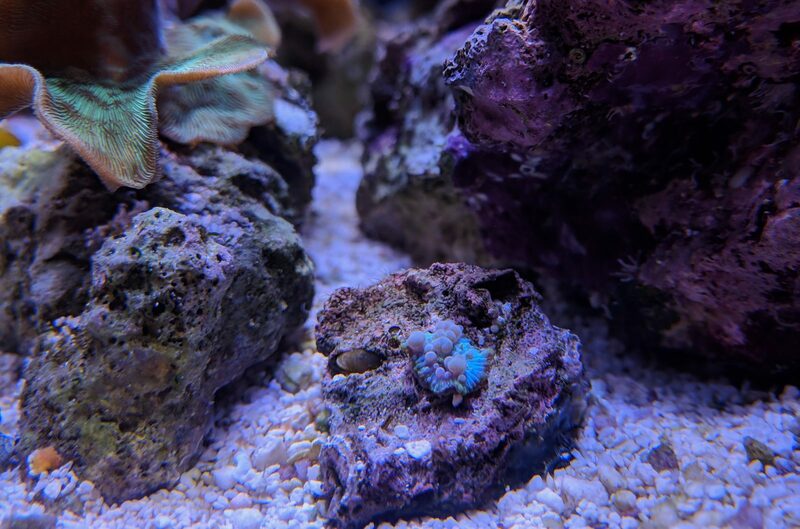 I've been searching for a very specific color combo since I started my tank. It was suddenly in stock at Vivid Aquariums so I jumped on it not knowing for sure what it would look like since it wasn't WYSIWYG. 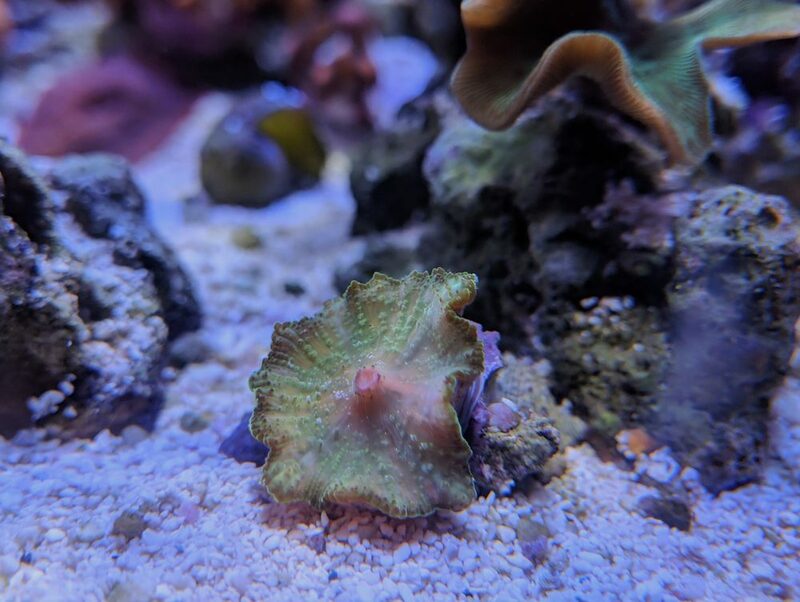 It ended up not exactly like their listing photo (https://vividaquariums.com/products/green-white-pipe-organ) but it's still lovely and they actually gave me two frags and I pretty much fell in love immediately. Still keeping an eye out for the green centered, all white petal one though. 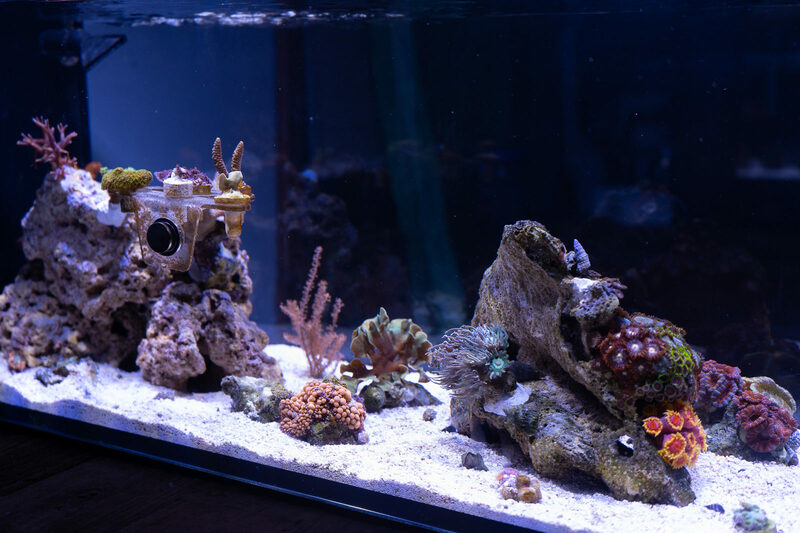 So anyway I'm waiting for my 2nd light to get here tomorrow and assuming all goes well with the light mount build and the tank is fully cycled and such I'll make the transfer in the next few days. Wish me luck, or even better, let me know if you have any tips for this process! Not everything is exactly how I want it yet, the leather is still mad, and I want to get the frags out, but overall I'm so dang excited! The extra cool industrial light mount I was planning didn't work out, so I ended up going with this, but it works and I definitely think the two AI Primes with different settings at the front and back is going to be super useful. 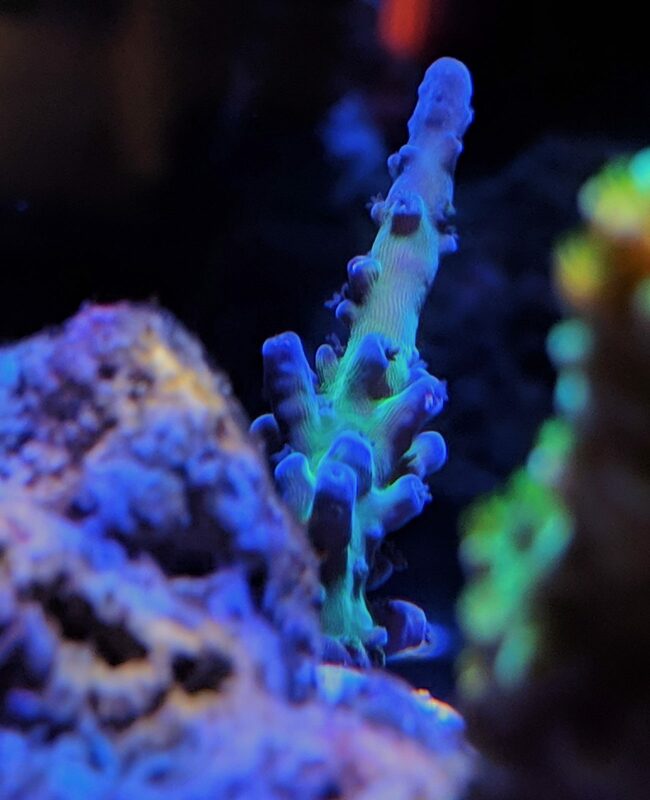 The guy I got the tank from threw in what I think is a just-hanging-on little dendro colony and a green slimer acro so those are some fun new additions! I decided I would try to have a rainbow of brightly colored sticks on the back rock, hopefully with not more than like 5 pieces. The pink millie I got from Vivid (with the pipe organs) just isn't going to cut it I don't think. Graygrumps seems to love his new caves and I'm thinking about trying another pistol shrimp friend for him. The hermits have been cruising all over the place and Maraschino (this name seemed much for fitting for the Pom Pom) and the emerald crab seem quite please to each have their own separate rock castles. 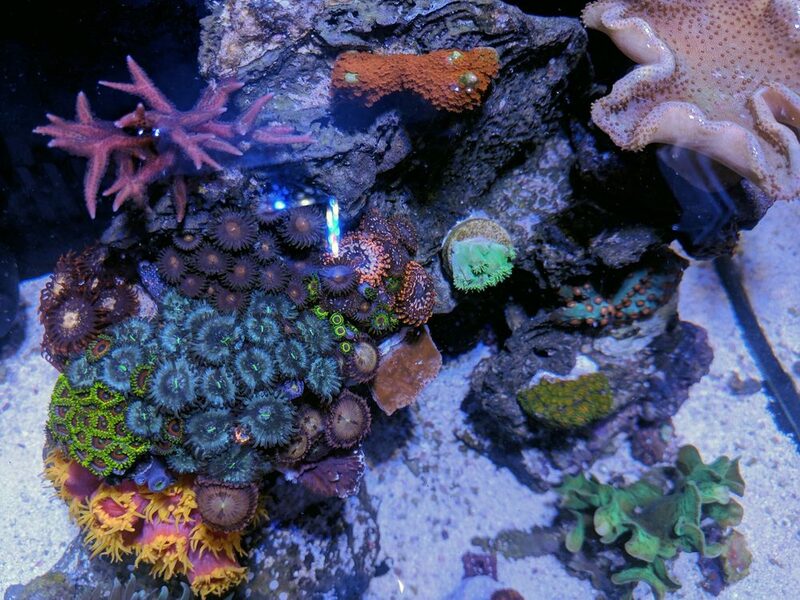 The corals are adjusting and most are in great shape. I'm a little worried about the possum wrasse (still doesn't have a name that's stuck, Maggie currently in testing). I've never seen it eat the foods I've fed (frozen mysis, flakes, pellets) but see it picking at the rocks, walls, and sand so I assume it's getting pods and such. I doubt I have a sustainable pod population in this tank though. It only comes out when the pump is off (though maybe this is just a learned feeding response), so I hope there's not too much flow for it. Late last night I had some friends over so I turned the lights on, pump off, and fed the tank and she was swimming SO weirdly, nose in the sand, tail up, bouncing into stuff. Seemed to be picking at the rocks, but doing a really bad/awkward job of it. She was super pale, but I feel like that's normal for the middle of the night. At one point she was in the cave with Graygrumps and I couldn't tell if she was stuck against his body or just wanting to cuddle. The flow was still on but it's super light without the pump. Then she just lay still in the sand against the glass right by our faces. Didn't really move at all, just scooted back a little and continued laying there looking at us. Kinda freaked me out! Was she just sleepy and confused and also saying hello? Or is she sick and having swimming issues? I turned the pumps off today and she came out a little and seemed pretty normal 🤷‍♀️. I'm not sure what pump is in here, but I know it's upgraded from the original (I got the tank used from someone local) so it's possible it could be a little much. I'm wondering if the leather doesn't like the flow either as it's right in front of it, but everything I read about yellow fiji's said that they seemed to like really high flow and light. Hopefully just needs more time to adjust. I'm considering getting the spin stream to make things a little more variable and undulating at least. I haven't gotten the skimmer to stop putting out microbubbles so it's off for now. 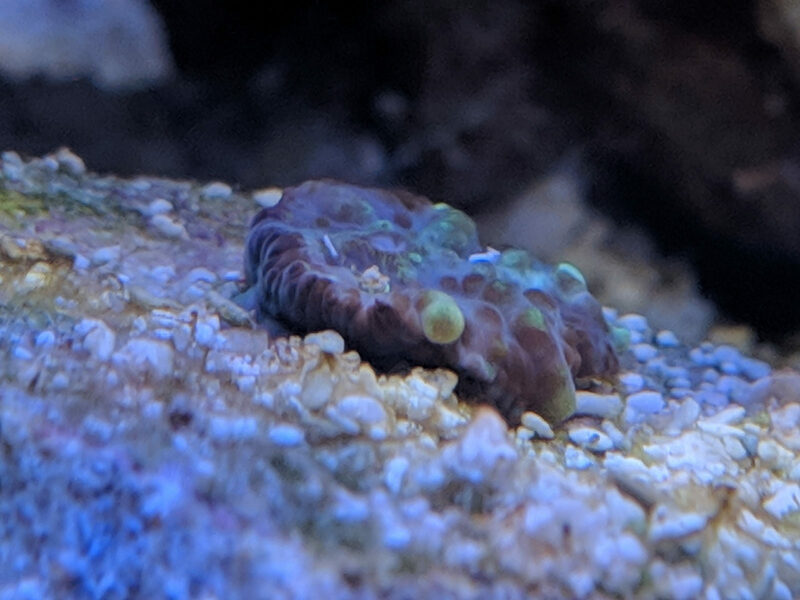 Our local frag swap is tomorrow and I won a contest for a baby bounce mushroom so I'll be picking that up, as well as an oregon tort. 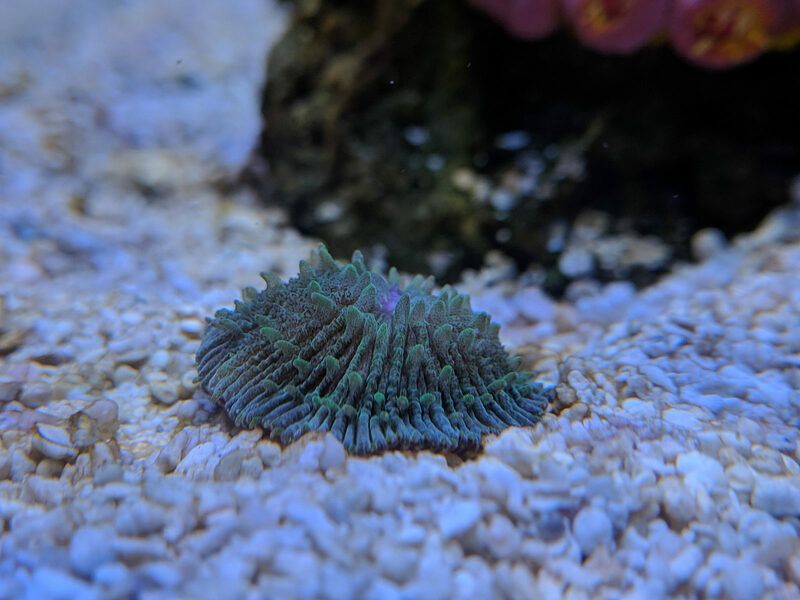 Trying not to make too many impulse buys as I really want to mostly stick with the corals I have and let them grow out in nice little colonies, except for a few special things I'm keeping an eye out for. We'll see how that works out, hah! So what's the normal protocol here? 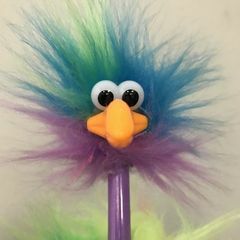 Do I start a new thread? Just update the title of this one? I feel like it's really still the same tank, just upgraded, so we'll stick with this for now. Wow! Looks great! And I like the light mount even if it’s not what you wanted. Wish I could win a baby bounce shroom. Post pics when you get it. I think Maggie must have just been disoriented from turning on the lights, especially if she seems normal today. Yes, I think keeping the same thread works - just change up the title as you make updates! I debated whether or not I should tell you this 😈 and I may regret it 😜 buuuuut, there's often not very many entries so you've got pretty good chances! Do you sell your RFA? If so I might have to get a couple from you at some point! No, I’m not a member. I’ve thought about joining but haven’t yet. When I checked it out before it seemed like everyone had 100-300 gallon tanks. It’s bad enough going to the LFS where they always seem critical of small tanks. Maybe you can talk me into going to a meeting though because it would be nice to meet some locals. I gotta bunch of RFAs! I’m sure we can work something out! What part of ATL do you live? Wow! I love this tank. Great pictures and nice work on the transfer! It's true about the yellow fiji - you can't give it enough light and flow IME. Mine is directly in front of my MP10 and also getting hit by the return. I love that wrasse. I wish I could have one or a pink-striped but I feel I'm pretty maxed out for fish with the two big clowns and the little goby. The new set-up is coming along. 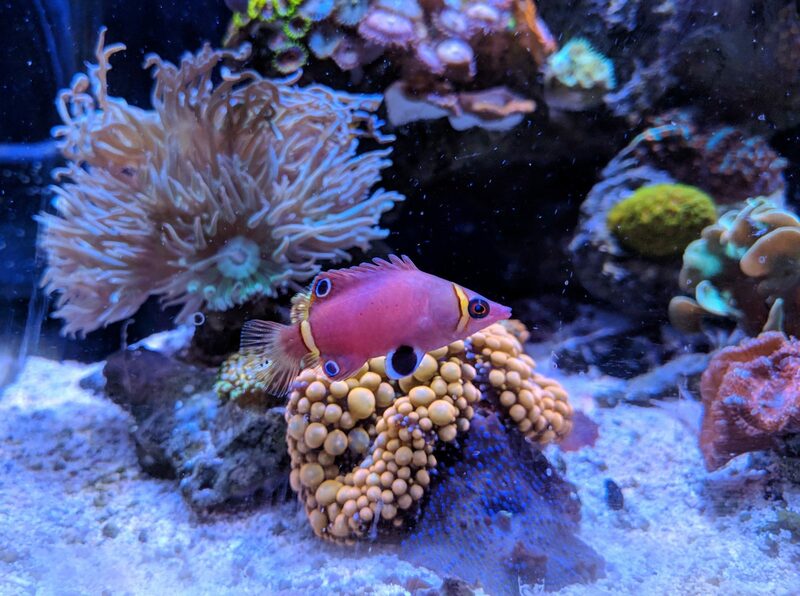 Still dealing with new tank syndrome stuff, a couple corals seem to still be in adjustment mode, and I'm re-figuring out what I need to dose, but everything is going pretty well I think. Is it diatoms or dinos? I know there's some ways to test, but I've been busy and am still hoping it will just go away on it's own here pretty soon. There's definitely less on the sand at least. I got my bounce and oregon tort frags! The bounce definitely doesn't look like much right now, and by that I mean a tiny pancake of coral 💩, but it'll be fun to see how it turns out. The tort lost a little of it's blue color (and turned green) while the seller was holding it for me, but it seems healthy! How long does it usually take acros to change colors? I guess this will be a good test for me to see if my system can get it back in really good shape. 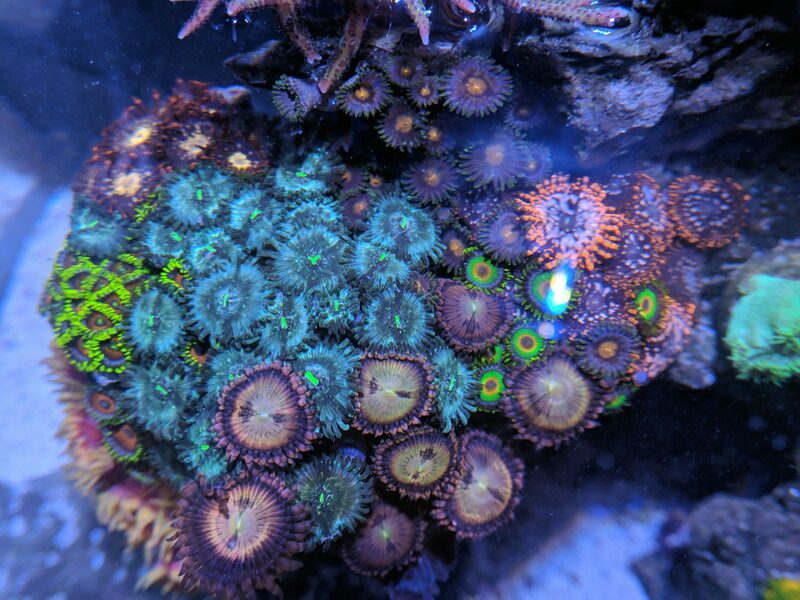 I alsooo bought a couple zoas and a fungia plate 😬. Red hornets and a pink diamond, so happy with them! 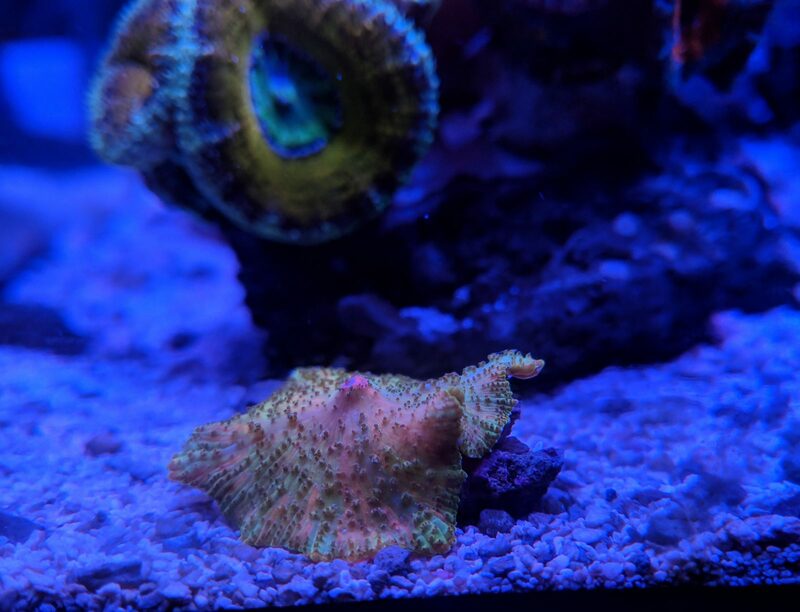 I was planning to get a fungia with a little more interesting coloration, but it was only $5 and so cute, I just decided to pick it up. Most of the corals are doing well. The yellow fiji still isn't 100% after the move, but seems to be improving every day. 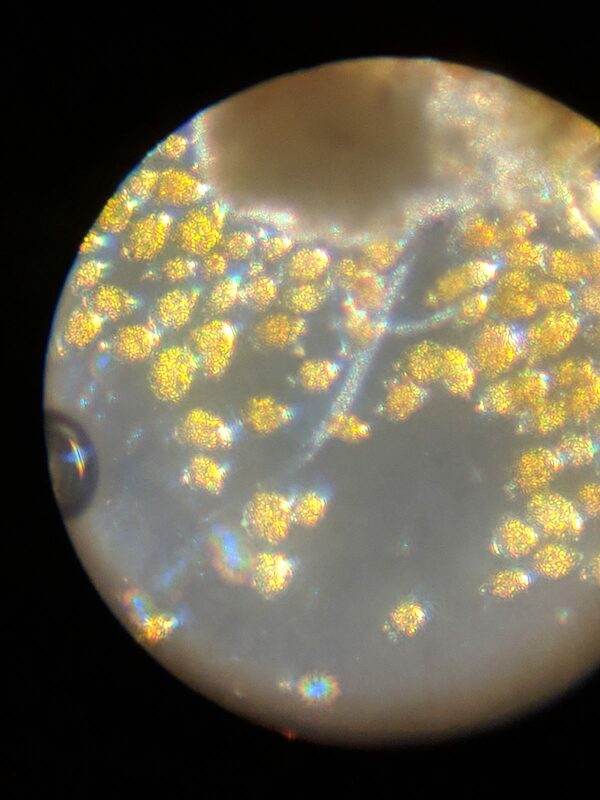 The sun corals have been sending out yellow filaments occasionally from the body of the polyps and I'm really not sure what that means. The birdsnest also had some white filaments that I'd never seen before so I assume it was all just a little stress and readjusting and not loving the crap-ton of epoxy I used. It's mostly all cleared up now. Can't wait to see what happens when these two meet... any day now. 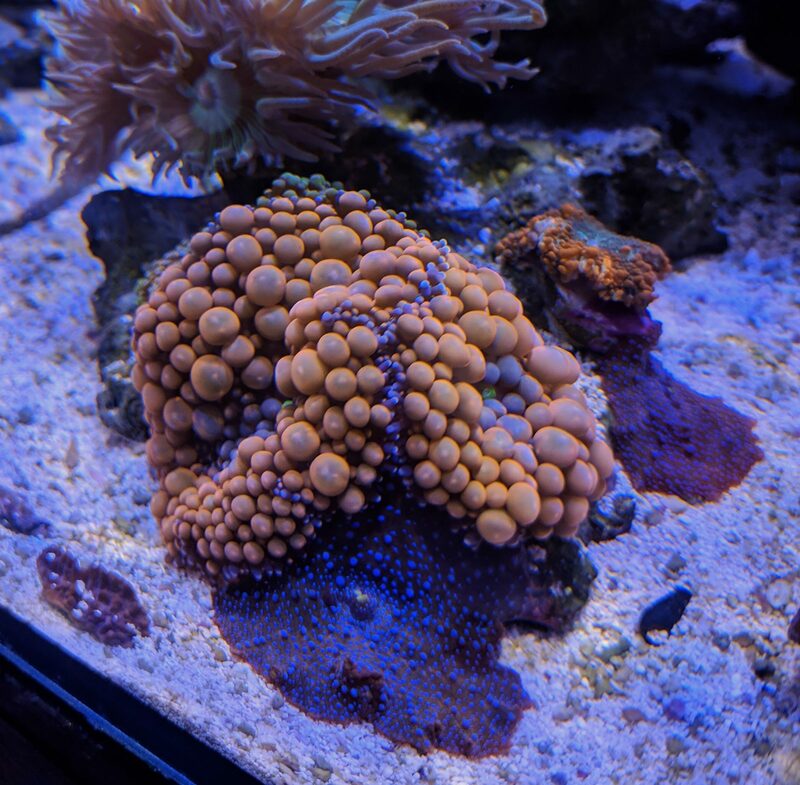 I am a little concerned about the flow on my SPS rock though. I decided to have that rock be the high flow, high light area since it would be back by the output, but really it's too close to the back and the outlet just flows out above and past all the SPS. I don't want the outlet just pointed straight down at the rock, right? 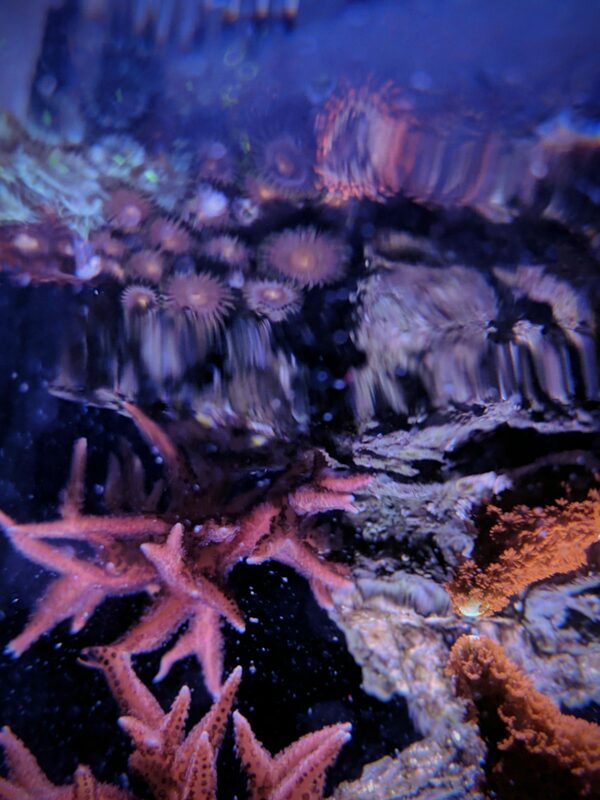 I've got the Aqamai pointed at the corals, but I'm not sure how much it really does since it's somewhat fighting with the strong outlet flow. I just got a spinstream in the mail today but so far it's noisy and greatly reduces the flow, so not sure how I feel about it. The Aqamai also might be more useful on the other side. I'll just have to keep playing with it. In exciting news, I got a new pistol shrimp friend for Graygrumps, but I think Graygrumps just isn't really into the roommate situation. 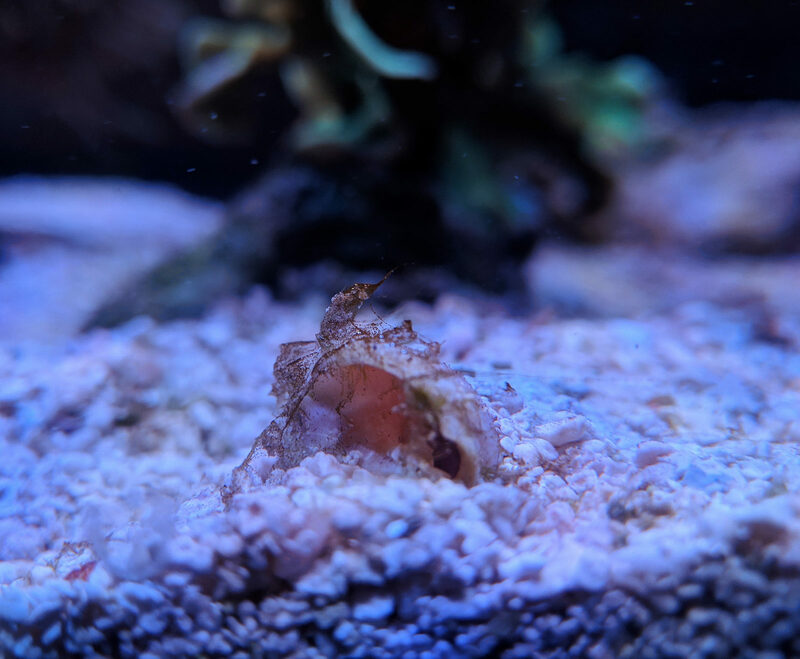 I put the shrimp right beside him when I released it, they said hello, and the shrimp went right back there with him so I thought it was all perfect, but eventually Graygrumps just moved to the back rock. Later I noticed the shrimp had moved to the back rock as well, but Graygrumps was back in the front. I'm not sure exactly what the situation is now as I haven't seen the shrimp at all since that first time, but there's some little tunnel holes in both caves, so hopefully it's doing ok. Maybe Gray just needs some time. The shrimp is tiny and the goby is full grown, so maybe they aren't the best match. I thought a tiger pistol might be more Graygrumps' speed, but didn't want to risk it attacking someone. 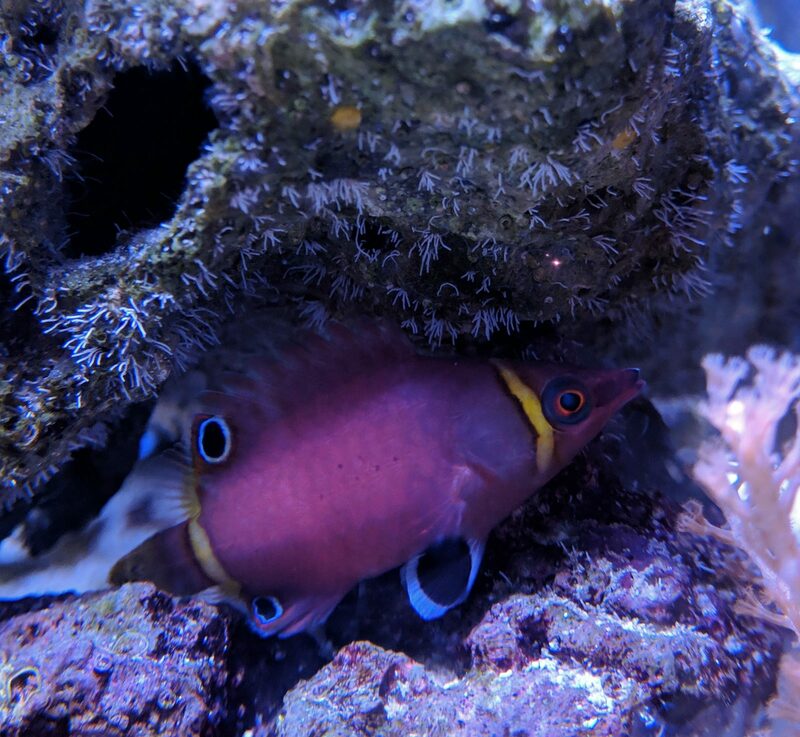 Oh and the possum wrasse seems totally fine, I think it was just completely out of it and confused that night I turned the light on and fed the tank at 1:45am. Her behavior was just so crazy! What can I say... I was a little "out of it" as well 🤪 . 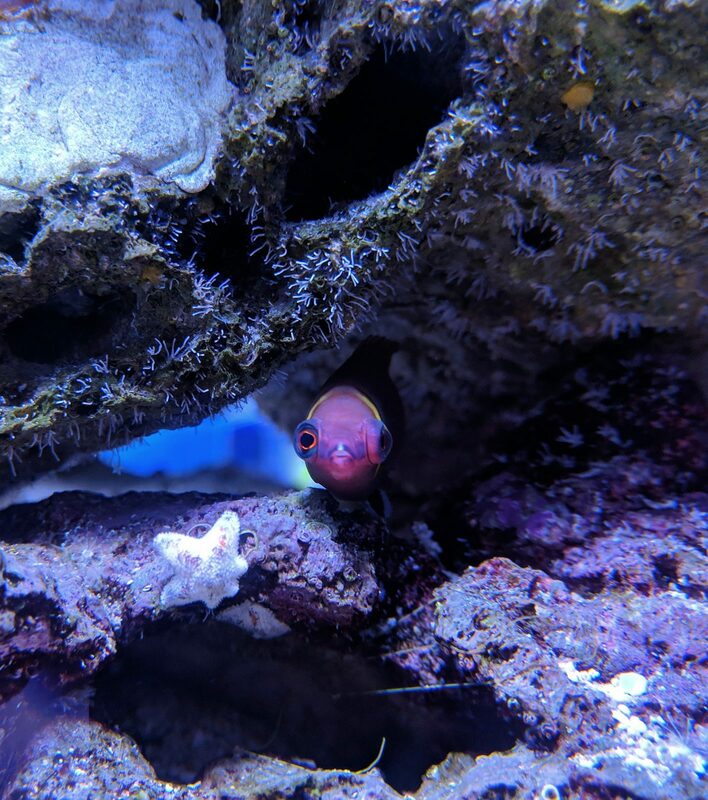 She's been normal and funny and cute but definitely stays in the rock work most of the time. So next important steps for the tank are figuring out flow and making a decision on a dosing pump cause I just can't keep up with the manual dosing routine. Leaning towards a Bubble Magus T11. Thoughts? 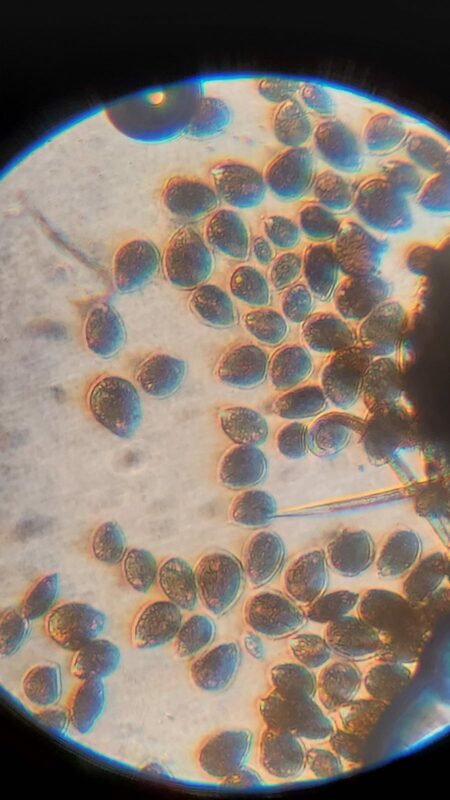 I used a microscope and have determined it's probably ostreopsis. Here's the pics. I couldn't get a good video but I feel pretty confident in my ID because of their circular movement. 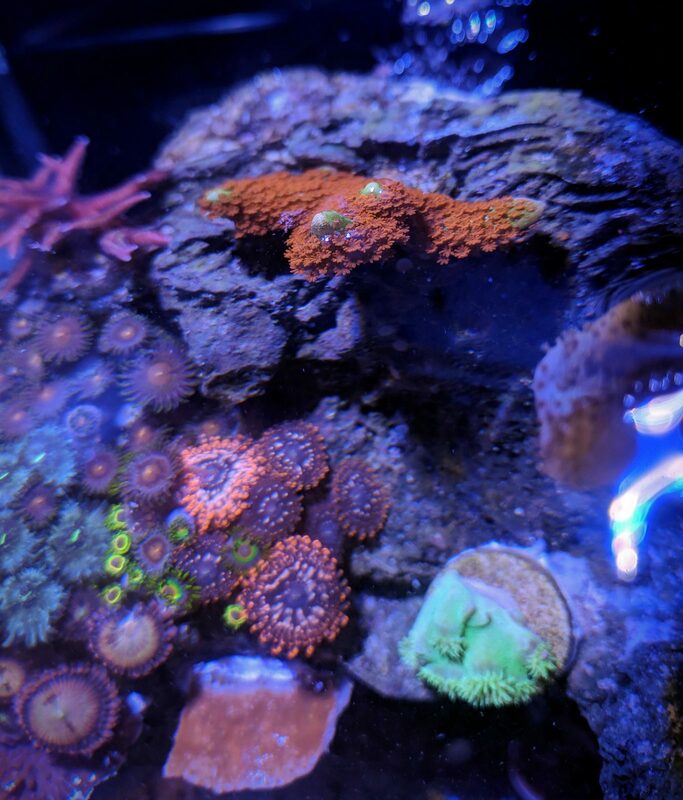 Can't believe I was being so casual about it a couple weeks ago, it's gotten a lot worse and several corals are starting to look bad. 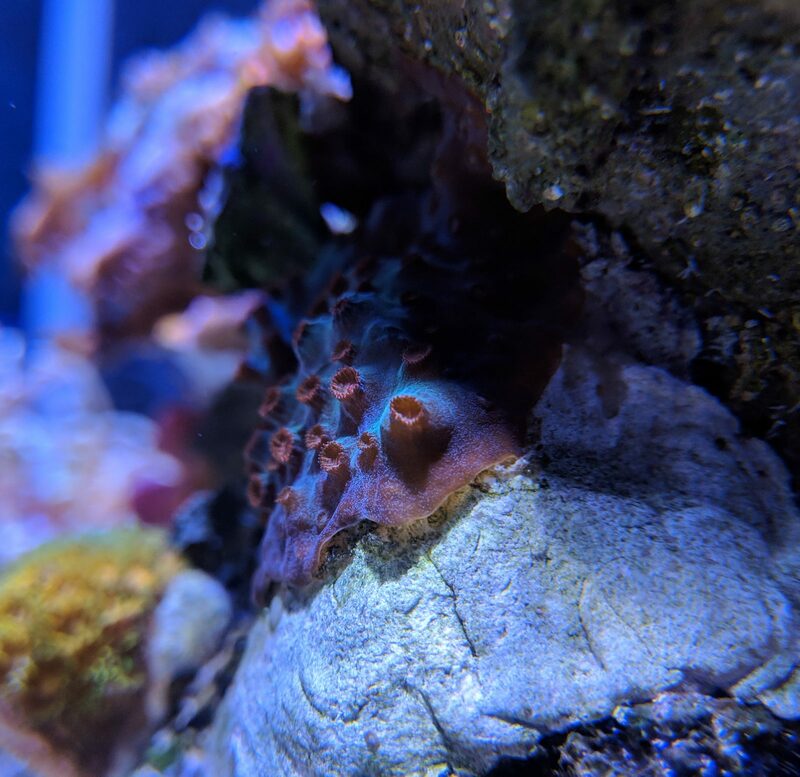 The gorgonian hasn't opened in a week or two, mint pavona is showing bleaching at some edges, a handful of zoas as well as my beloved pipe organ haven't opened for several days, and there's not good polyp extension on the birdsnest and oregon tort. Most other things just look generally unhappy. 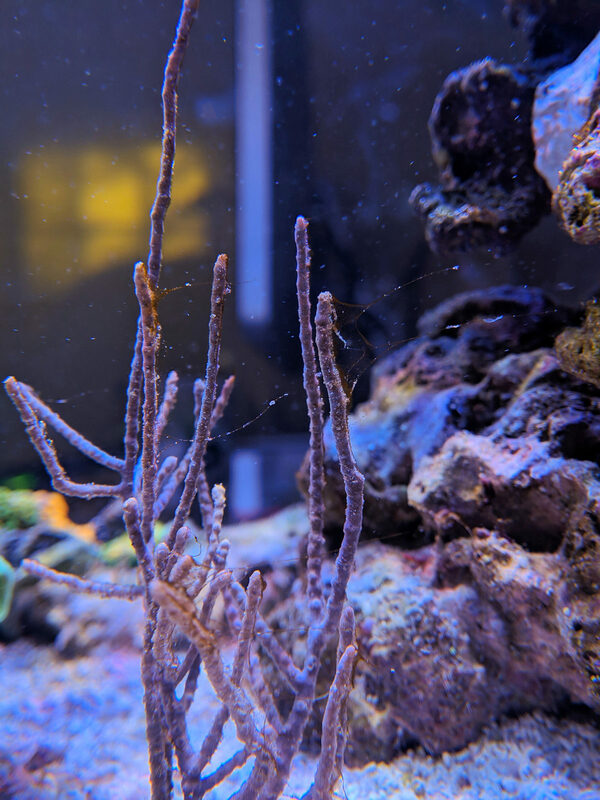 I feel like this is a fairly normal thing to happen since I moved to a new tank and added fresh sand and rock (the new rock was live, but it wasn't in a main tank or sump so maybe it didn't have TONS of life) and before just assumed it would just kinda start to go away like all the other "new tank" things did when I first started. 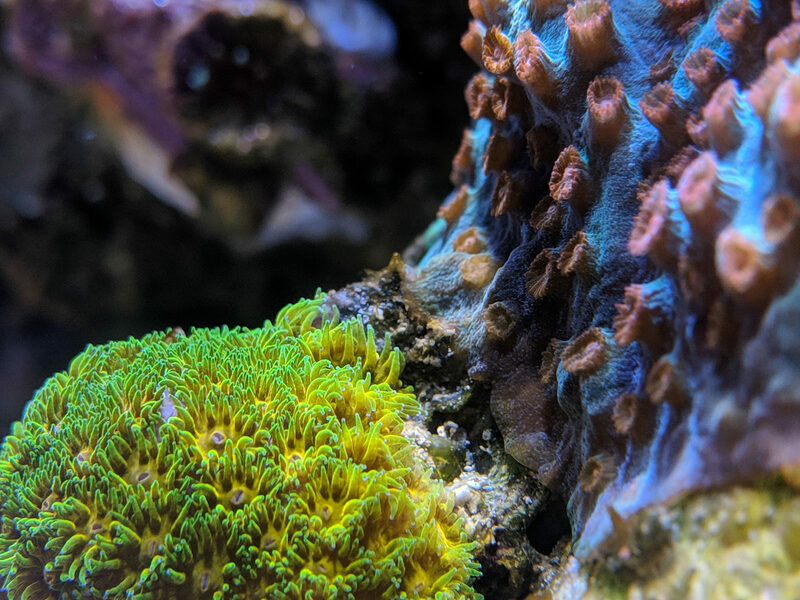 That still may be the case, but this stuff just multiplies too quickly and has too much of a negative affect on the corals to just ride it out. 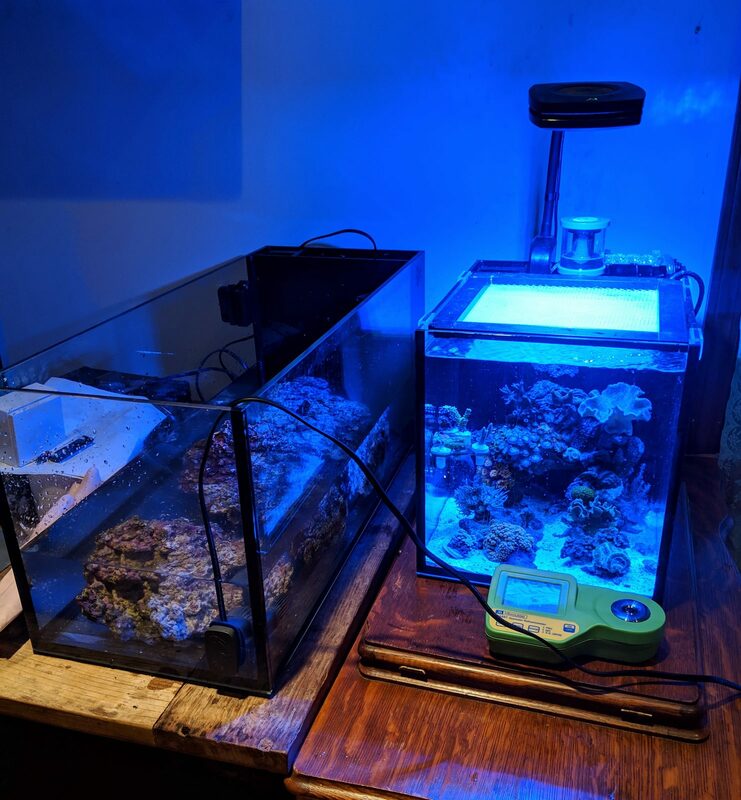 After lots a research, I decided not to do a water change this past weekend, have a UV sterilizer on the way, will probably be adding pods and phytoplankton to increase mircofauna diversity (though yesterday a pod explosion started so I'm wondering if they are going to help get rid of the dinos and I won't need to add more), keeping up feeding to try to increase nitrates and phosphates (.3 and 0 respectively, maybe I'll just start dosing though), and maaaay try Vibrant if this doesn't show any changes. Hoping to not try any chemical stuff but we'll see. I know hydrogen peroxide and blackouts are also an option. I also have a dosing pump on the way so hopefully that will stabilize some things, though I'm sure consumption is down right now so it's probably going to take some adjusting. The dinos! The horror! 😨 Here's hoping you can beat them real quick! Your tank is very lovely and deserves better than a wall-to-wall coating of brown slime. I’m not going to be much help here. I have no clue where’d I’d even begin. So at least you have a plan. Hopefully some others can chime in on the approach. Keep us posted on the battle. 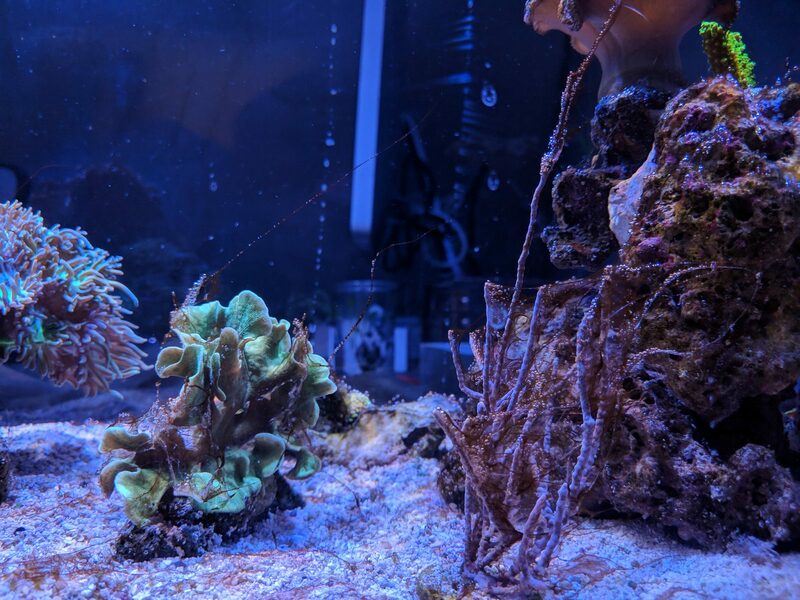 I've recently read the journals of several other reefers who are battling dinos, and I believe one at least was able to beat them definitively. Unfortunately I can't quite remember who it was though >< I will dig around in the archives and see if I can come up with the thread. You'd better believe you've got our support! Dinos are the worst possible thing you could have growing in your system, and any aquarist worth her salt will tell you that beating them is one of the most satisfying things on Earth. It sounds like you have already taken some decisive steps with the purchase of a UV sterilizer and all the research you've done, so I'm sure they will be on the run in no time.